12 years (How did that happen??). While I was in graduate school, I worked as a trainee for the Buffalo & Erie County Library System in the local history department. When I graduated, I moved to Baltimore, Maryland to work at the Central Library of the Enoch Pratt Free Library. I held several different position at the Pratt, including managing the Nonprofit Resource Center, managing the Job & Career Information Center, and Assistant Manager of the Business, Science and Technology Department. After 10 years in Baltimore, I moved back to New York to work for the Nassau Library System. I have an office all of my own, and I savor every minute of it as I’ve never had one before. My desk seems to have exploded at the moment, but I do my best to bring it back under control before I leave each day. I’ve also got various tchotchkes on my shelves and prints on my walls that inspire me, and remind me of past adventures. My favorite part of my office is my big white, dry erase board. I use it to keep track of my projects and as a ‘parking lot’ for ideas that I might not be able to run with just yet. I live by my Google Calendar both professionally and personally. I also have a paper calendar on my desk where I keep track of my daily and weekly goals and to-do lists. At the end of each day, I like to review what I accomplished and make my to-do list for the next day. It makes my mornings so much smoother. It feels like I spend most of time with email, but I know that’s not really true! I spend a lot of time researching, planning, and working on projects that will help our 54 member libraries become stronger and provide even better services to their communities. Typical, what’s that? My days are never the same and that’s one the things I love about my job. 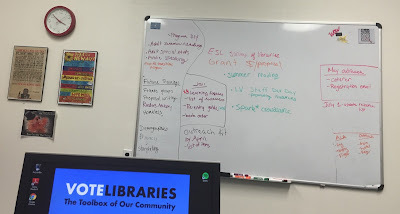 I might be planning or facilitating a training for member library staff, meeting with a community group, digging into a question that a member library staff person has stumped me on, or conducting a program at our County Correctional Facility. 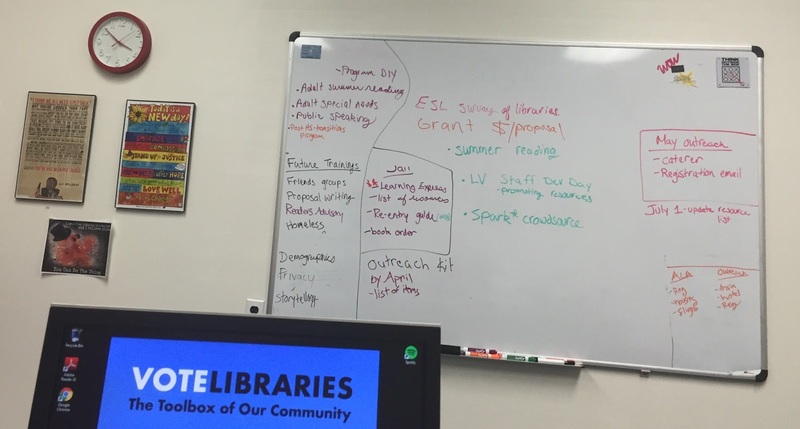 If you had told me when I was a brand new librarian that I would be facilitating workshops for other librarians and absolutely loving it, I would have told you that you were lying. I never, ever expected to find so much joy in having the opportunity to help empower library staff in their jobs. Professional violinist. The fact that I don’t like to practice a lot makes this one a challenge! It’s not so much one moment but lots of little moments. I love that my career provides me with opportunities to empower people through so many different avenues: supporting someone as they master using a mouse; handing an inmate in prison their very own book to keep; helping a library staff member work through a challenging situation and seeing them come to the solution on their own; facilitating a training for library staff and hearing lots of excited ideas being exchanged. Only one? A big one for me is not asking for help when I find myself overwhelmed. Lesson learned (and one that I need to periodically remind myself of). It’s ok to talk to your supervisor and explain what’s going on. Asking for help does not equal failure. Your supervisor is there to support you & can only really provide that support when you bring them into the loop. Making music either with my handbell choir or on my violin, lesson planning for my ESL tutoring sessions (some day I’ll not wait until the last minute), but most likely plopped on my couch doing some form of brainless activity to recharge my introvert soul. Andrea is on Twitter as @alsnyder02.